Precise Control & Monitoring of Cabin Temperature and Humidity Levels For precise control and monitoring of cabin temperature and humidity levels, Cruisair offers a number of modern, wall-mountable controls. From electromechanical to microprocessor platforms, Cruisair has the right control for your vessel. The Q-Logic control system represents the most intelligent and sophisticated control over cabin climates. Featuring the Qht or Q3 display panels, the Q-Logic system has an optional CAN-bus network adapter which connects to several popular helm and cabin touchscreen control systems. 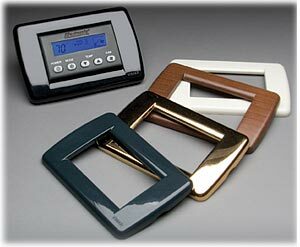 Complete the look of your controls with a wide selection of stylish bezels, designed to compliment the decor. Introducing Smart Touch, the easiest to use, most intuitive marine cabin control in the world. Highly customizable, Smart Touch lets you choose whether the home screen displays a lot of information or just a basic temperature control. Intuitive submenus step the user through full system access. Even the color palette displayed on each control can be chosen by the user. Smart Touch Cabin Control Installation & Operations Manual. The Q3 keypad/display for DX systems works with the Q-Logic Control System. This high-technology display has a bezel look and offers user-friendly, logical operation. It has raised buttons and an LED display window. The Cruisair Q-Logic Control System is designed for use with both direct expansion evaporators and tempered water air handlers. This dual microprocessor-based control consists of a power/logic circuit board in the system's electrical box that operates with Qht and Q3 control/displays. An optional CAN-bus network adapter is available for new Q-Logic systems and as a retrofit for existing installations. Supporting both the Qht and the Q3 controls, this adapter provides ship-wide network monitoring and controlling of multiple DX systems or air handlers. The CAN-bus adapter adheres to CAN-bus Standard 2.0B and is fully ISO compliant. It is available in two CAN-bus communication protocols to support connection to several popular helm and cabin touchscreen control systems. 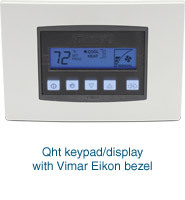 The Qht control/display is European in style and accommodates an assortment of decorative bezels — including a new model sized to fit the popular Vimar Eikon bezel. The Qht display features raised buttons for easy access and control and an attractive blue backlit LCD. 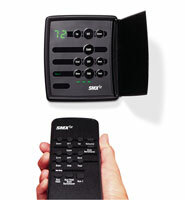 The SMXht keypad/display is a microprocessor-based controller designed for the precise monitoring of self-contained and remote direct expansion air conditioning systems in marine environments. It is designed for use with the SMX II-HV power/logic board, operable on both Direct Expansion and Chilled Water systems. 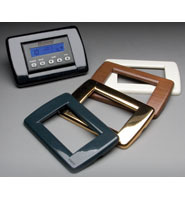 The SMXht keypad/display has a sleek, modern Euro design. Available in grey or white, it features raised buttons for easy access and control. Decorative snap-on bezels are available in Vimar® Idea or Gewiss® Playbus styles, and a variety of colors and materials to match your vessel's interior. The SMXir keypad/display and optional remote control work with both DX microprocessor control systems offered by Cruisair – SMX II and SMX Net. SMX II logic systems offer all the standard operational and safety features required for most Direct Expansion systems. SMX Net logic systems add networking capability and other special features that make it unique in the industry. The SMX II or SMX Net power/logic board comes installed on the designated self-contained unit or condensing unit. Either logic system can be retrofitted in the field to replace an electromechanical switch assembly. Electromechanical rotary-knob switch assemblies provide conventional control over basic air conditioning functions. 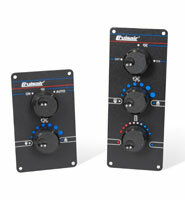 Both 115V and 220V switches are available. 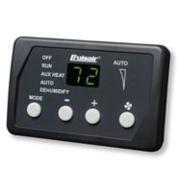 3-knob assemblies provide function selection (Off-Fan-Run), fan-speed control, and a room thermostat. 2-knob assemblies for tempered water systems provide function selection (Off-Fan-Run) and fan speed control. (In these systems the thermostat is on the air handler.) 1-knob assemblies provide function selection only (Off-Fan-Run).